Imagine picking up "The world's most powerful smartphone" for a ridiculously low price. 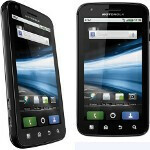 This weekend, the Motorola ATRIX 4G can be yours for just $49.99 from Amazon. While AT&T offers the dual-core powered handset for $200 with a 2 year contract, Amazon normally has a $99.99 price tag on the model. And while that price seems low, cutting it in half this weekend might just leave you stunned. Your $49.99 will buy you a device with a 4 inch qHD display, running a dual-core Tegra 2 processor. The 5MP camera on the back captures video at 720p with a 30 fps rate. And the .3MP front-facing camera allows you to see who you are talking to with video chat. All of this is powered with a 1930 mAh battery. Android 2.2 is on board and there is 1GB of RAM under the hood. Storage can be increased by up to 32GB with a microSD card. If you have been waiting for a price break to pick up the Motorola ATRIX 4G, things won't get much lower than the $49.99 that Amazon is selling the device for this weekend. I'll take 2 broken 4G devices please! clever why u think this device is broken...i haven't truley got a chance to play with it yet? Broken meaning the 4G does not work, yet. Come to Sprint as rumored and have this deal. THEN I'll take it seriously. I am not going near AT&Throttle! I have had the Atrix for only one month and it is dead already. Overheated and after two new batterys they are sending me a new one. I guess there was something to that story that came out during testing about overheating. If you are thinking about this phone you might want to wait. Also I paid $149 for mine and you can get them now for $49 at Amazon! This article was very deceptive. It forgot to mention that this offer is only available for those switching to AT&T from another network. So, if you are already on AT&T's network, you cannot get this phone for the price of $49.99. @Networkdood: if you announce the exploitation of this, AT&T will certain in the future find a way to block that. Don't share that on a freakin' website... THis is how loopholes get blocked, tard. You must live under a rock as AT&T has been aware of this for many months and has already implented a plan to stop IPHONE users from WIFI tethering for free - since they are the highest percentage of users...stop being the idiot who calls out others. Correct, for new customers only. Called Amazon to makesure. At present I'm on ATT but I have NO CONTRACT, I could upgrade with Amazon for $99. Called ATT really got the run around but basixly was told to upgrade was $199. They said I should use Amazon they could in now way match price. Any idea when INFUSE is comming?